Rain rain please stay in Delhi, go away some other day!! Delhi’s PM2.5 level falls after showers and was on a moderate scale on Sunday. 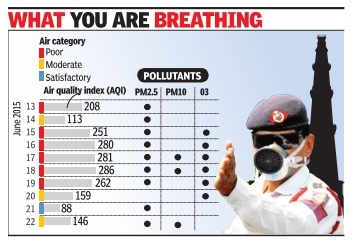 Monsoon does bring cleaner air days for different polluted cities by reducing the PM2.5 levels, but will have no impact on the gases such as oxides or nitrogen, Sulphur dioxide or even benzene, an hazardous chemical and a compound of crude oil and petrol that can be harmful even at trace levels.